Most employees want feedback about their work and strive to improve their performance. You know what it takes to achieve results; your success got you a leadership position. Providing high-quality performance feedback to your team members gives them the information they need to succeed. 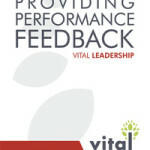 As a manager and team leader, you are aware of your team members’ performance, and uniquely positioned to provide effective feedback. It is critical that you are able to establish a process that helps improve team member performance while maintaining strong relationships within the team. Whether given formally during a performance review or informally during a one-on-one meeting, clear and actionable feedback helps ensure the growth and success of team members. 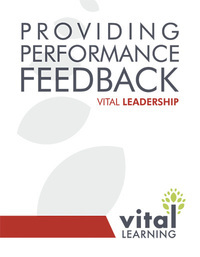 The Vital Learning Providing Performance Feedback™ course equips managers and team leaders with a fair and fact-based collaborative model for feedback sessions. This model helps reduce discomfort and improves the payoff from challenging feedback discussions between a manager and team member. Providing effective performance feedback is highly collaborative; when team members agree to the process, they are committed to its success and will work to produce great results. Click on the “e” to immediately enroll and begin the Providing Performance Feedback online course.